We finally arrived in Salzburg, the city where the Red Bull X-Alps starts, in (unfortunately) very poor weather conditions. 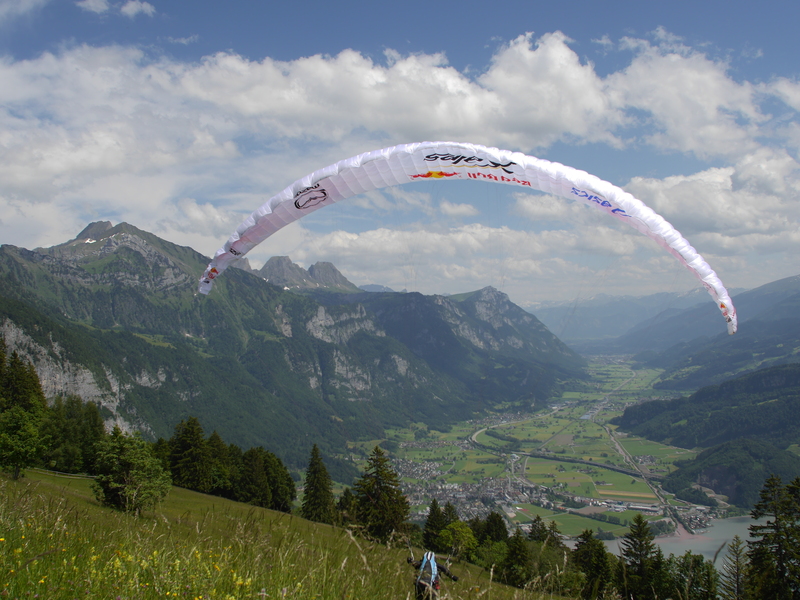 Fortunately we did manage to fly down from the first turnpoint, the Gaisberg, but were not able to fly much of the route. We headed towards the second turnpoint the Dachstein and decided to hike up from the south side via the Sudwand Hutte. The picture above shows Konstantin Filipov hiking up towards the Sudwandhutte. The hike up proved to be a bit more difficult than we anticipated. The via-ferata line was covered with one meter of snow and making it very dangerous to climb to the top. There were moments where the cloud cover on the top cleared and this gave us a little bit of hope of at least flying down from the top. Lots of snow made the transitions quite interesting. At about a hundred meters from the top we had to make the difficult call to rather climb down as the only way we could get up there safely was with the use of snow axes, which of course we did not have with us…. Next it was on to Aschau Chiemsee, but yet again the weather was not in our favour with cloudbase basically on the ground we decided to move on to the Zugspitze arena. We spent the night there and checked out the flying options but thanks to the G7 meeting we were not able to fly due to airspace restrictions up untill the 15th of June. Again bad weather in Brenta forced us on to Switzerland, but the bad weather in the South caused Fohn wind in the majority of the area around the St. Moritz turnpoint We could only move to the eastern part of Switzerland to try to run away from the Fohn. This gave us some time to visit our friend Ivo Grunenfelder in Sargans. We did manage to do some hike and fly training in the Walenstadt area with the plan to head more south to the St. Moritz and Brenta turnpoints but bad weather again is forcing us to head back North with the hope of getting some good flying conditions on Wednesday and Thursday.